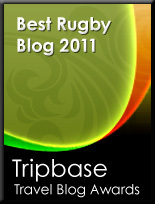 TOTAL FLANKER...a rugby blog: Andy Farrell - England's loss, Ireland's gain? There has been much wailing and gnashing of teeth amongst English rugby pundits at the news that Andy Farrell is to replace Joe Schmidt as Ireland's head coach after the World Cup in Japan next year. Farrell, you will recall, was jettisoned by England following the 2015 World Cup debacle (alongside head coach Stuart Lancaster, amongst others) and the news that he will now take the helm in Ireland means that Sir Clive Woodward, for one, is (somewhat melodramatically) "almost filled with despair". Woodward bemoans English rugby's loss of "an outstanding individual...a coach of massive potential" and, while I don't necessarily disagree with such sentiments, what is being forgotten here is that Andy Farrell being on the England coaching staff previously caused all sorts of issues when it came to England selection and the merits or otherwise of his son, Owen. Is Woodward honestly saying that England should seriously be considering appointing a head coach whose son is the fly half and captain? This isn't the local club Under 16s. I'm sure Farrell Snr will prove to be a more than decent international head coach and who knows, in a few years, once young Owen has hung up his England boots, we may still see a Farrell in charge of England. The question, perhaps, is which Farrell will it be? Or - and this is not beyond the realms of possibility - will it be both of them?